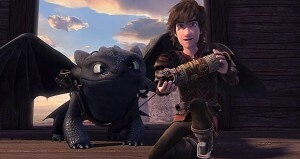 Dreamworks Animation have released the first preview of their new How To Train Your Dragon tie-in TV series, Dragons: Race to the Edge. It’s coming to Netflix on June 26th. Interestingly, it’s all coming on that date: All 13 episodes will be available at once. In this latest iteration, “Hiccup and Toothless lead the Dragon Riders as they soar beyond the borders of Berk and discover the mysterious Dragon Eye — an ancient artifact filled with secrets that will lead them to new lands filled with undiscovered dragons. But the heroes find themselves pursued by marauding dragon hunters, who will stop at nothing to seize the power of the Dragon Eye.” Check it out over at Comingsoon.net. Meanwhile, just today came another Dreamworks announcement: Kung Fu Panda 3’s release date has been moved. Again. This time they’ve moved it up from March 18th to January 29th. We still gotta wait until 2016, but at least it’s coming sooner! That Kung Fu Panda 3 release date is very, very worrying. January? And you know Star Wars is still going to be trouncing the box office, so this is a "send-it-out-to-die" release date if I ever saw one. Dreamworks has not officially stated it, but many in the Hollywood buzz-circle believe that Dreamworks' strategy is to release the film one week before Chinese New Year.